Wingspan of 45 mm and will sit still in afternoon sun although a rapid flier makes it easy for the beginner to take photos off. Loves sitting on leaves on the ground. The larvae feeds on a variety off plants . 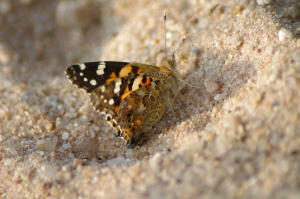 Will find this Painted lady all over South-Africa .